Sweet, Sweet Recovery! Muscles don't grow inside the gym. They grow because of what you do outside the gym. Recovery. 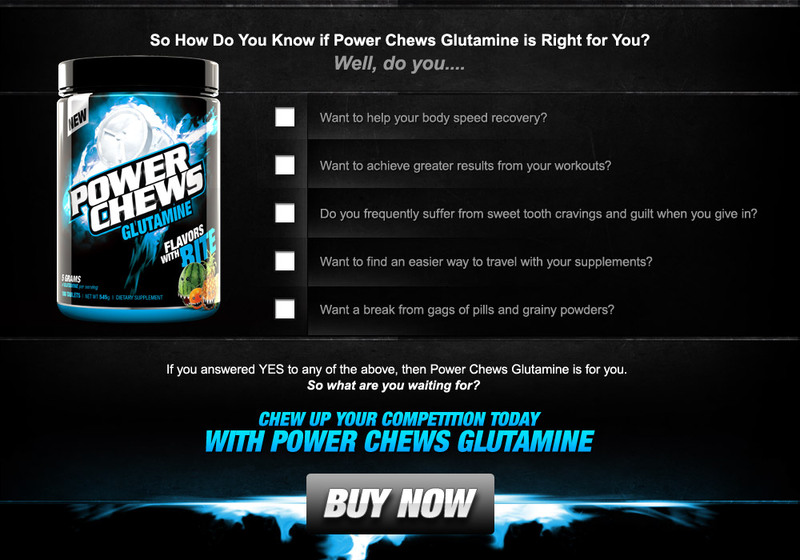 That's why Power Chews is proud to offer you 5 massive grams per serving of pharmaceutical grade, lab-verified L-Glutamine in an addictively delicious, sugar-free chewable! Read on to find out how this rock star amino is helping to change the face of performance recovery. "Is your workout recovery going slower than a grandma driving on the freeway?" Then you won't want to squeeze in another workout until you read this from start to finish. Chew on this - Research suggests that after an intense training session, nearly 50% of your body's glutamine levels are depleted...as in wiped out, gone, Ka'put! And that's not good for a number of reasons. ? First, for you to recover and build the kind of muscle and strength you're after, your muscles must be in a state of positive nitrogen balance...a state that's enhanced when monster levels of amino acids are jam packed inside your muscles. And guess which amino is the most abundant of them all? That's right, L-glutamine. In fact, L-glutamine represents nearly 60% of the free-form amino acids inside your muscle, suggesting it's a very important amino for athletes. So it only makes sense to keep this superstar amino crammed inside every last muscle fiber to help promote recovery. But guess what? Because L-glutamine is in such high demand throughout your body, and because building muscle isn't necessarily your body's numero uno priority, your body has no problem robbing your muscles to get more of it. That's because L-glutamine is used extensively throughout the gut and immune system to help maintain optimal performance. Therefore, supplementing with L-glutamine may help reduce the amount of muscle breakdown that occurs from the depletion of intramuscular L-glutamine stores. ? 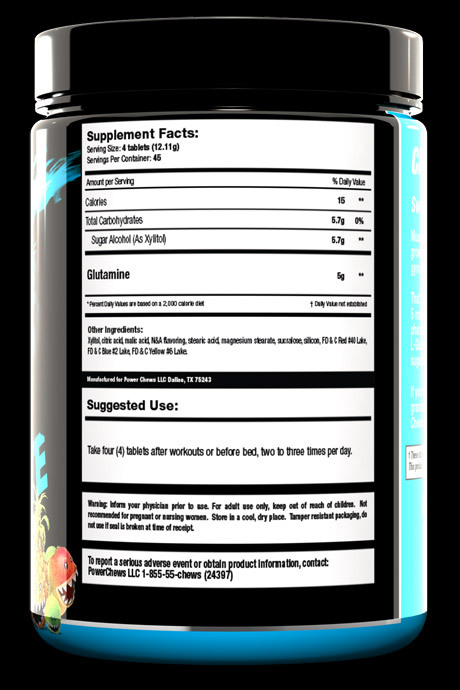 But here's where L-glutamine really becomes a must have, rock star amino in your supplement arsenal. Scientists have discovered that L-Glutamine can increase plasma human growth hormone (HGH) levels in men over the age of 30 by nearly 4 times that of normal baseline values. Want to hear something even cooler? ? 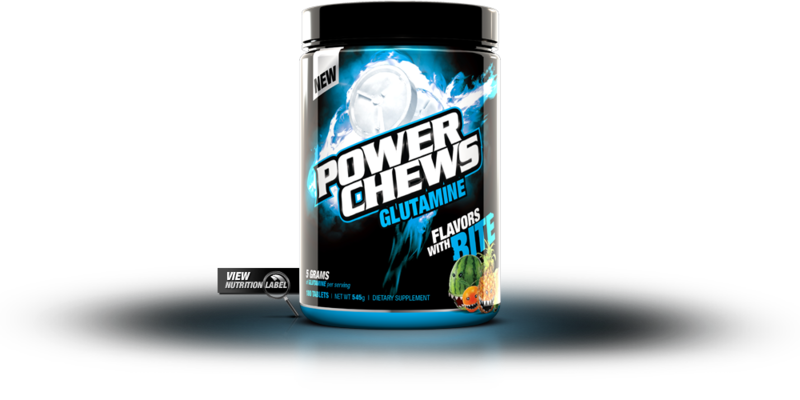 Power Chews Glutamine contains more than twice the amount of glutamine discovered to elicit this powerful physiological response! So what about the taste? Look, just because you're a serious athlete doesn't mean that "serious results" and "choke it down" need to go hand-in-hand. But then again, most chewables are notorious for tasting like your father's antacid, so what gives? Well, we'd be lying if we told you Power Chews Creatine tastes "good." Scouts honor, it doesn't. No way. In fact, every bottle is loaded with 4 addictively delicious, sweet-tooth-satisfying, blow-your-mind flavors that taste out-of-this-world AMAZING! Flavors such as heavenly Hawaiin punch, tantalizing lime, mouth-watering watermelon, and sunny orange papaya! 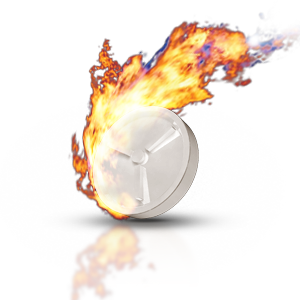 No matter what your age, chewables are emphatically fun, and way easier for athletes on the go. With zero sugars and a full clinical dose of creatine packed inside, Power Chews Creatine will deliver all the guilt-free, sweet-tooth satisfaction you crave, and a whole lot of muscular horsepower too.